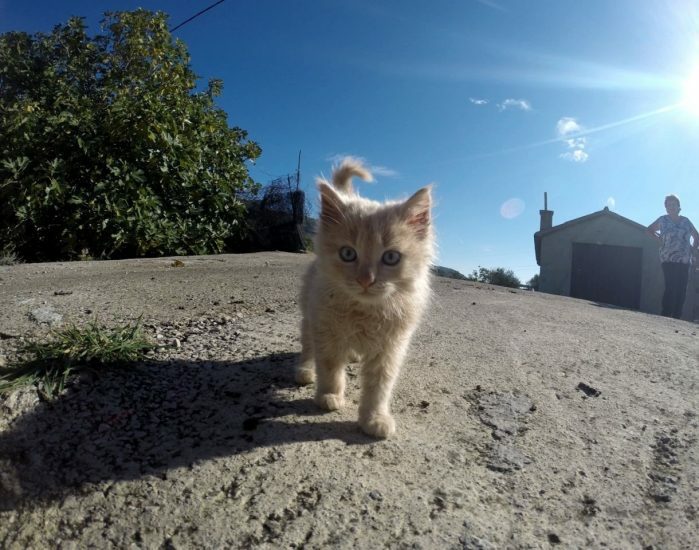 We approached Monika Kucic, author of MeowsNPaws and Animallama blogs, to write a post about approaching cats, and she provided an exceptional article we know you’ll enjoy. Here are her TIPS FOR APPROACHING A NEW CAT. Many cat lovers such as me jump for joy when they see a cat, be it a friend’s indoor cat, stray cat minding her own business at the park or neighbor’s cat lurking from behind a tree. And many times, our first reaction would be to simply approach the cat and pet her as much as we can! 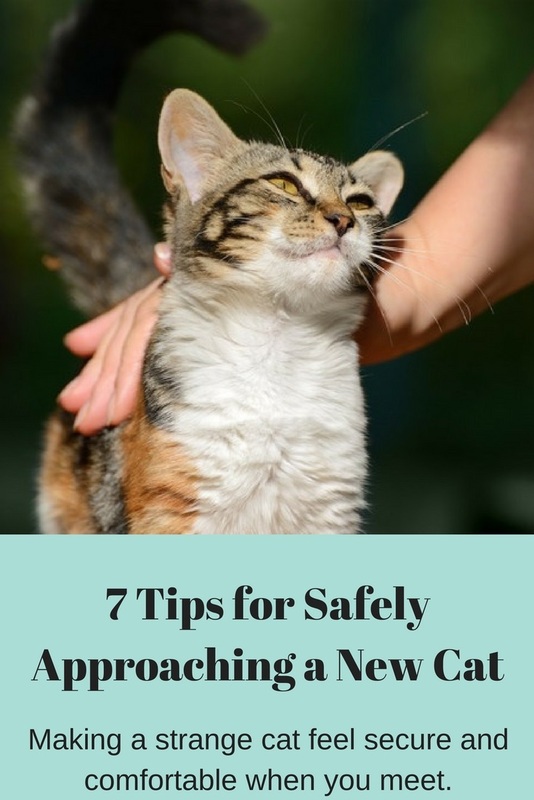 So, the next time you meet or see a cat you don’t know, there are a few things you need to keep in mind so that the introduction will go smoothly. First things first…The cat should feel safe in your company and not feel threatened. You can achieve that by not looking the cat directly in the eyes for too long. Cats can see your direct eye contact as an intimidation so don’t stare at her. When you do make a short eye contact with a new cat, do a slow blink. Cats usually blink slowly when they feel safe and content so slow blinking will show the cat that you mean no harm! Another thing that will make the cat feel safer is getting lower to the ground so that you don’t look too huge and intimidating. You can crouch or put your knees on the ground. If the cat is shy or has had bad experiences with humans, she will be more reserved towards you. Give the cat some time to adjust to your presence and let her come to you instead of rushing to get to her, which would only scare her. Move slowly and avoid sudden movements that might scare the cat. Cats have a very fast fight-or-flight response and sometimes even quickly lifting your hand to scratch your nose can scare them away. Avoid speaking and laughing loudly, or doing anything loud for that matter, while you try to befriend a new cat. Make your voice soft and gentle and talk slowly to avoid scaring her. While us humans mostly rely on our sense of vision and sound when meeting new people or animals, cats heavily rely on their sense of smell too. 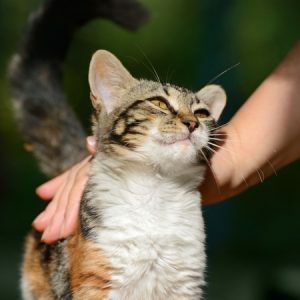 Gently relax your hand somewhere where the cat can easily come to sniff it and wait for her to approach you and get to know your smell. If you take your time, you can befriend an unkown cat and become friends. If you want to speed up the process, you can offer the cat some food or treats that will lure her closer to you. Free food is always hard to resist! Notice how the cat you’re trying to befriend acts while near you. The cat might be too shy or feral, so it will be hard or maybe even impossible to ever get her to trust you. If the cat is running away as soon as she sees you, hisses at you and is showing signs of irritation, don’t push it. Leave it at that until next time you see her and wait until the cat is ready to approach you. This may take a few days. Offer her some food to gain her trust more easily. Keep in mind that if you try to run towards the cat and make any drastic steps to get the cat to come over, it is only going to lead to a cat being even more frightened of you than before. So go slowly, give the cat some time and good luck with your new kitty friend! Monika is the owner of a pet blog called Animallama where she writes about pet care and shares her love for pets as well as her newest, feline focused blog MeowsNPaws.com. Thanks for the read! It seems that many of the advice are the same for cats and (small) dogs. I have met several small dogs that behave a lot like cats. These are excellent tips! I as well want to cuddle every cat I encounter on the street, but haven’t been too successful so far. Will definitely try your recommendations, thanks for that! I loved this post! Whenever I see a stray cat, I always try to get them and take them home, or to the humane society. The one time I tried, the cat actually scratched me. Other times, they just ran away from me. These tips will come in handy for the next time I try to rescue one!